This is a circuit schematic of Bass Boost, requires a 9 volt voltage. this circuit using a stereo system. you need to add a 1M resistor between the input lines to ground. and then, you can make this circuit as a pedal effect you will combine into another pedal. I want to provide a challenge for you. see the scheme in a way that I present below. if i give a very clear scheme, of course you can not get a challenge. That's the point of learning. apologize for the less detailed of this presentation . Because the key details seen in the image Use one stereo potentiometer to adjust the bass tone from a low level to high level. if you want to use this scheme, use large speakers so that the bass sound can be heard for real. do not use a small speaker. it would seem useless. Do not let one put ic position, this can be fatal. ic will break or burn. ic an audio source from this scheme. try to choose the appropriate ic and original. I do not recommend you to try this scheme in your lab. but if you really want to try, then the risk is borne by you alone. but according to my experience, this scheme succeeded in raising the bass tones around 50%. This circuit uses a stereo system. note the power supply that you provide, whether it is equipped with a CT system. if not, please upgrade it first to the Center Tap systems (CT). 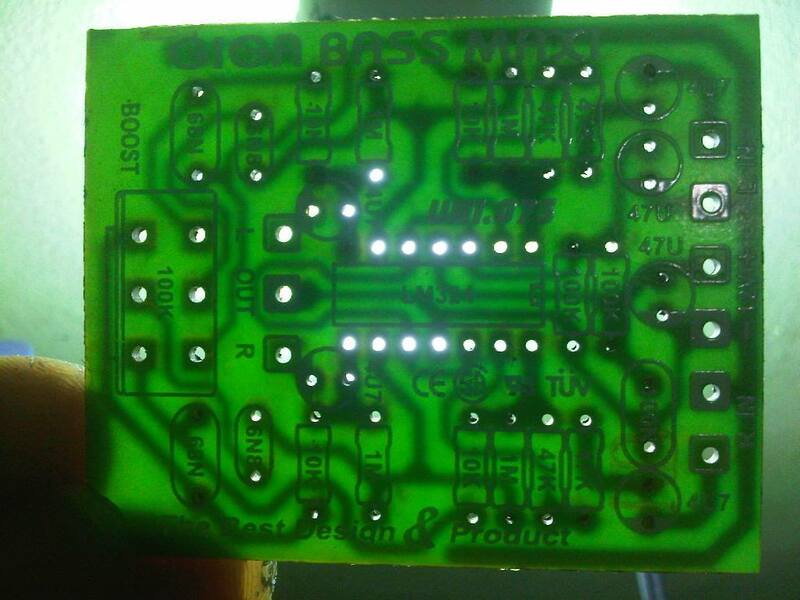 of course, the component must correspond to that of the pcb layout. To connect this circuit need techniques way is to connect the paths in from poer amplifier into the path out of this series, and then connect the lines out the tone control to the point in this series. Do not forget to use the cable with a good quality. solder properly,. correct soldering tin will look shiny when it is dry. To operate this circuit, use the appropriate voltage is 9 volts dc. using excessive voltage will damage the IC which resides in the circuit. be careful in adjusting the voltage on this circuit. This post is not recommended for people who do not have experience in the world of electronic audio. Use components that original because it affects the quality of sound that will be produced. do not forget to always use good cables so that the hum can be minimized. Based on the above circuit schematic of the most influential component is the ic LM324. This is the central coordinating function audio processing performance of all components in the circuit. Avoid excessive heat while doing the soldering process to these main components. ic components are particularly vulnerable because of the heat causing damage. In soldering is strongly advised not to linger too so as not to generate excessive heat.